Benina International Airport (IATA: BEN, ICAO: HLLB) (Arabic: مطار بنينة الدولي‎) serves Benghazi, Libya. It is located in the town of Benina, 19 kilometres (12 mi) east of Benghazi, from which it takes its name. 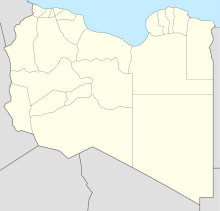 The airport is operated by the Civil Aviation and Meteorology Bureau of Libya and is the second largest in the country after Tripoli International Airport. Benina International is also the secondary hub of both Buraq Air and flag carrier, Libyan Airlines. As of 17 July 2014 all flights to the airport were suspended due to fighting in the area. The runway length does not include a 300 metres (980 ft) overrun on the end of each runway. The Benina VOR-DME (Ident: BNA) is located 1.9 nautical miles (3.5 km) northwest of the airport. The Benina non-directional beacon (Ident: BNA) is located on the field. Benina was a Regia Aeronautica airport in 1917. During World War II the airport was used by Italian 15°Stormo, and after the United States Army Air Forces Ninth Air Force during the Eastern Desert Campaign. Known as Soluch Airfield, it was used by the 376th Bombardment Group, which flew B-24 Liberator heavy bombers from the airfield between 22 February and 6 April 1943. Once the combat units moved west, it was used as a logistics hub by Air Transport Command. It functioned as a stopover en route to Payne Field near Cairo or to Mellaha Field near Tripoli on the North African Cairo-Dakar transport route for cargo, transiting aircraft and personnel. A new terminal with a capacity of 5 million passengers was to be developed north of the existing runway at Benina International under a 720 million LYD (€415 million) first-stage contract awarded to Canada's SNC-Lavalin as of 2008. The final cost was estimated at 1.1 billion LYD (€630 million). As with Tripoli International Airport, the new terminal was designed by Aéroports de Paris Engineering. Preliminary work and site preparation had started as of May 2008, but it remains unclear when the terminal will be open for operation. The contract for Benina International Airport included construction of a new international terminal, runway, and apron. The new airport would have been part of an extensive new infrastructure programme being undertaken by the government of Libya throughout the country. In March 2011 (2011-03), forces loyal to Muammar Gaddafi bombed the airport. No damages were reported to facilities. The airport was closed on 16 May 2014, due to clashes in the area between militias and forces loyal to General Khalifa Haftar. As of 1 August 2014, international airlines had suspended all flights to Libya. As of 5 August 2015, the airport was closed to passenger traffic. On 15 July 2017, the airport was reopened for commercial flights after three-years of closure due to fighting in Benghazi. According to reporting in Le Monde, French special forces have operated out of Benina airport. On 4 April 1943, Lady Be Good, a World War II B-24 Liberator based at Soluch Field, missed the airport while returning from a bombing mission in Italy. It crashed in the Libyan Desert 434 miles (699 km) southeast of Soluch Field and was lost for 15 years. On 9 August 1958, a Vickers Viscount registration VP-YNE of Central African Airways crashed 9 kilometres (5.6 mi) south east of Benina International Airport, killing 36 of the 54 people on board. ^ Airport information for HLLB at World Aero Data. Data current as of October 2006. ^ Airport information for Benina International Airport at Great Circle Mapper. ^ "Benghazi-Benina Airport". SkyVector. Retrieved 14 September 2018. ^ "Benina NDB". Our Airports. Retrieved 14 September 2018. ^ "Benina VOR". Our Airports. Retrieved 14 September 2018. ^ Endress, Gunter (20 May 2008). "Libya to restructure air transport sector". London: Flightglobal. Airline Business. Archived from the original on 30 June 2013. ^ "Libya: Gaddafi forces bomb Benghazi as US indicates no-fly zone support". The Scotsman. 17 March 2011. Archived from the original on 18 July 2013. ^ "Gaddafi's planes strike around rebel stronghold". Reuters. 17 March 2011. Archived from the original on 27 July 2013. ^ 90% of aircraft destroyed at Tripoli airport, Libya may seek international assistance RT. 15 July 2014. ^ "International airlines unsure about dates for resuming Libya flights". Libyaherald.com. Retrieved 21 August 2018. ^ al-Warfalli, Ayman. "Libyan government offensive in Benghazi stalls as Islamists dig in". U.S. Retrieved 21 August 2018. ^ "Libya's Benghazi airport opens after three-year closure". Africanews. Retrieved 15 July 2017. ^ Guibert, Nathalie (24 February 2016). "La France mène des opérations secrètes en Libye" (in French). Le Monde. ^ Stephen, Chris; Willsher, Kim (24 February 2016). "French special forces assisting anti-Isis efforts in Libya, say sources". The Guardian. A small French detachment has been operating from Benghazi’s Benina airport, the sources have reported, assisting forces of the internationally backed Libyan authorities in Tobruk. ^ Stratfor (10 March 2016). "Satellite Imagery of French Special Operations in Libya". YouTube. Retrieved 29 June 2018. Stratfor Military Analyst Sim Tack explains a series of images revealing security improvements at Benina air base. ^ "Booking a Flight". Buraq.aero. Retrieved 1 October 2018.